Tis the season, right? To be honest, I practically started pulling out the pumpkin spice in August! I get entirely too excited for fall. If love were a season, this would be it. It’s the perfect time to cuddle up with your person or fur baby, indulge in pumpkin flavored everything, and watch some football. At least that’s what Saturdays look like in our home. Our house is seriously divided come the Mississippi State vs. Alabama game, but every other Saturday is a perfect combination of Hail State and Roll Tide! 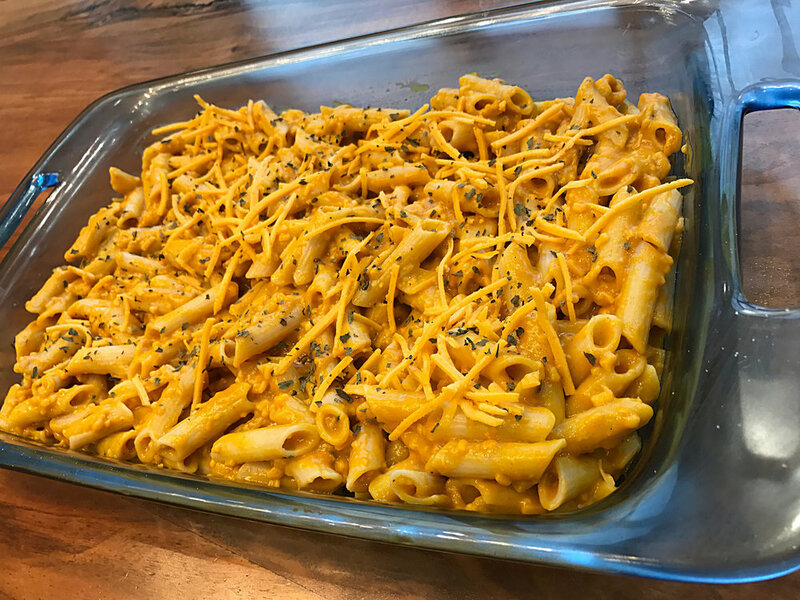 With it being the start of pumpkin season, I thought it was appropriate to kick off my first Dine blog post with one of our holiday favorites: Pumpkin Mac & Cheese! This is a gluten free and vegan recipe, but it can easily be modified if you wish. Last year we took this dish to my family’s house for Thanksgiving. It was the only dish that was completely gone by the end of the night—some having had seconds and even thirds. If it passed the test with my southern family, it will definitely pass yours. It also passes the “I don’t know how to cook” test. You can do this, pumpkin! So let’s get started! 2. While your oven is heating, fill a large pot with water and 1 tsp. salt, and cook pasta according to package directions. Once cooked, drain pasta and set aside in a large bowl. 3. In a saucepan—or pot—melt butter over low to medium heat. Add flour and stir for about one minute. Add pumpkin puree and 2 cups of cheese. Add salt, pepper, and pumpkin spice to taste. I can’t help but taste test as I cook! For that reason, it’s hard for me to give specific amounts of things like spices. I just add slowly until I am happy with the result. 4. Once you are happy with the taste of your sauce, pour mixture over your bowl of drained noodles. 5. Toss noodles in sauce until evenly coated. Then pour the noodles into a sprayed casserole dish. Add extra cheese on top. For additional baked flavor and texture, sprinkle gluten free bread crumbs on top. 6. Place Mac & Cheese in oven for 20-30 minutes. Cook until noodles are nicely baked and cheese has melted. 7. Serve hot and garnished with basil. Invite your friends over and share the pumpkin love.